Easy-access ground floor unit - no stairs! 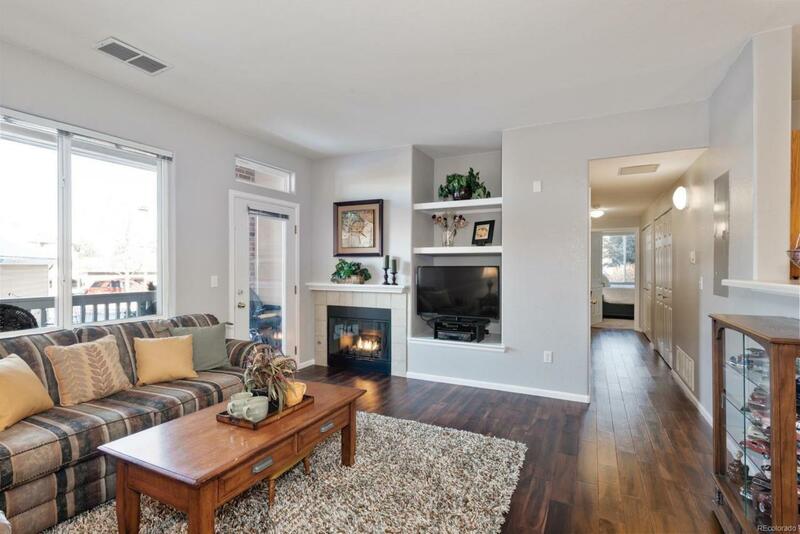 Beautifully updated and maintained 3 bed, 2 bath condo in quiet community. Gorgeous Acacia hardwood floors throughout, and premium carpet in bedrooms, installed within the last year. 9 ft ceilings and open floor plan! Unit freshly painted, has new 50-gallon hot water heater and new microwave. Master bath remodeled with new vanity, stone counter with twin undermount sinks, faucets, matching fixtures, and an exquisite tile floor. Master tub is an oversized soaker. Main bath also freshly painted, new light and towel fixtures and also has dual sinks! Unit has nice built in office area, in-unit laundry, with full size washer/dryer included. Large closets and additional storage with custom shelving located within patio space. Cozy gas fireplace. Community clubhouse has been freshly remodeled and includes workout facility and pool. Unit has 1 carport and 1 reserved parking space. Seller is a real estate broker licensed in the State of CO. Offered by Steps Real Estate 101 Llc.